Larlin's Home Improvement understands that working with electricity in your home can be very dangerous, and nothing any do-it-yourself homeowner should ever tackle on their own. 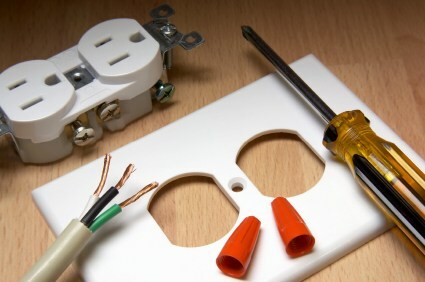 While some repairs such as a typical light bulb replacement or replacing an electric outlet/switch covers are basic, easy-to-perform jobs, anything else will require the skillful hands of a knowledgeable professionals at Larlin's Home Improvement. Save - For small electrical work, Larlin's Home Improvement will save you money over hiring a professional electrician. Let's face it. You don't need a 4-6 years of apprenticeship and a state license to change a light switch. Why pay for it? Larlin's Home Improvement can easily perform switch replacement, troubleshoot circuit issues, and fix outlets and lights. Larlin's Home Improvement has the tools, experience and skills necessary to perform basic electrical work reliably and affordably. Quick - Larlin's Home Improvement can troubleshoot your electrical problems and resolve simple electrical problems quickly. No need to wait for a master electrician to fit you into his schedule. For fast action on your electric issue, call Larlin's Home Improvement. Call (203) 267-0607 today to learn more about how Larlin's Home Improvement can quickly and affordable do your electrical work.